Climate change is threatening Easter Islands archaeology through coastal erosion. Easter Island is renowned for its mysterious moai statues that stand along its coast facing away from the sea. They are thought to represent the spirits of chiefs or high-ranking ancestors of the Polynesians who discovered the island about 1,000 years ago, and later named it Rapa Nui. The remote Chilean island in the southeastern Pacific Ocean has a population of around 5,000, with some 60,000 annual visitors, who mostly come to see the moai and the ceremonial ahu platforms on which many of them stand. But, centuries after the collapse of its civilisation, the island’s rich cultural heritage has come under threat from climate change. The warning was outlined in a United Nations report that looked at the potential impact of climate change on World Heritage sites, and how this might affect global tourism. The moai statues are thought to represent the spirits of the Polynesians who discovered Easter Island. 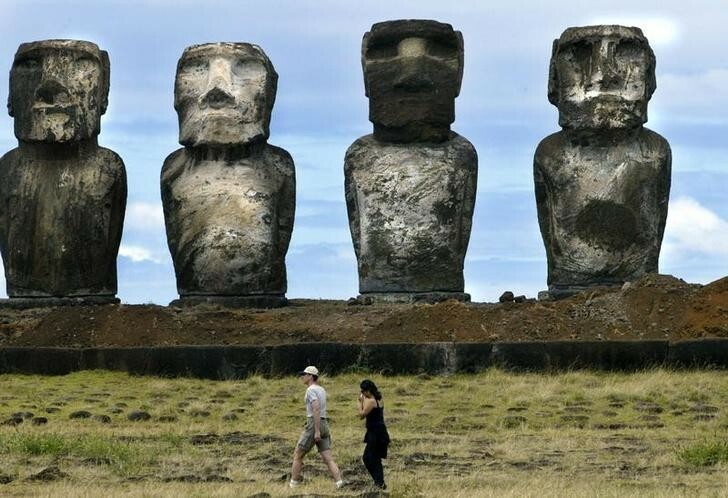 According to the report, the biggest impacts of climate change on Easter Island are expected to be water shortages due to reduced summer rainfall, sea-level rise, coastal inundation and erosion. Most of the moai and ahu, which date back to around 1250-1500 AD, are located on the coast and the report says erosion has already been found at several important archaeological sites. “With climate change, the greater wave heights and increased energy of the waves hitting the ahu’s vertical basalt slab walls, the ahu are expected to undergo worsening damage and the moai that sit on top of them could topple,” the report says. A New York Times journalist and photographer who visited Easter Island reported that waves had already reached some of the statues and platforms. 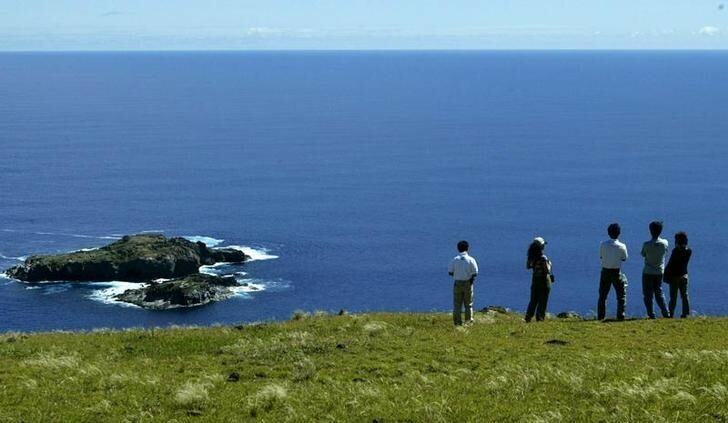 Tourists look out to sea on Easter Island, 4,000 km west of Chile. The fate of Easter Island is not only worrying residents, but also archaeologists, who fear that the ocean could wash away clues to the island’s greatest mystery: namely, what brought an end to the civilization that created the moai? Theories include resource depletion, disease, civil war, or even rats. However, some researchers believe that the answer might lie in the island’s tombs, which still hold some remains. Climate change is also threatening other Pacific islands. Kiribati, a tiny nation of low-lying islands, risks being submerged. In 2014, former president Anote Tong bought a plot of land in Fiji so that Kiribati’s 100,000 citizens would have a refuge when their homeland became uninhabitable. However, communities in Fiji are also at risk from rising sea levels. Residents of the village of Vunidogoloa were the first to abandon their homes and move inland under the Fijian government’s climate change programme with dozens more earmarked for potential relocation. And in 2016, researchers discovered five uninhabited islands in the Solomon Islands that had already been lost to rising seas and erosion.